On behalf of the Kanata Baseball Association and the Scott Tokessy Memorial Gold Glove Tournament Organizing Committee, we would like to take this opportunity to welcome your team to the 23rd Annual Scott Tokessy Memorial Gold Glove Tournament. The tournament is open to Rookie (7/8 year olds), Minor (9/10 year olds), Major (11/12 year olds) and Junior (13/14 year olds) teams at both the “A” and “B” competitive levels. The 2018 edition of the tournament will be held this weekend from Friday August 3, 2018 to Sunday August 5, 2018 in Kanata, Ontario. Dedicated to the memory of the young athlete from Kanata, the tournament was established in 1996 in memory of Scott Tokessy, a twelve year-old boy who died suddenly of an irregular heartbeat after hitting a home run for his house league team in May of that year. This tournament is a lasting tribute to a young man who exhibited all the characteristics and ideals of Little League Baseball; sportsmanship, fair play, hustle and dedication.Since 1996, this charity event has developed into one of the premier Little League Baseball Tournaments in Ontario. Last year’s tournament raised $40,000 bringing the total donation to the Cardiology Department at the Children’s Hospital of Eastern Ontario (CHEO) to $380,000 since the tournament’s inception, where it is used to fund equipment purchases and research. 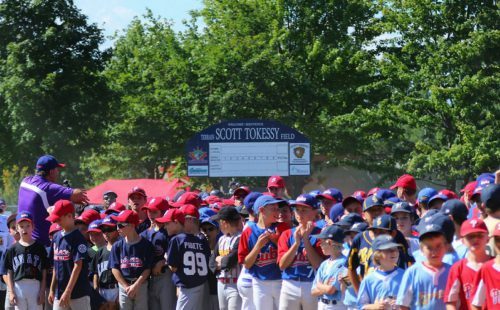 Enthusiasm about the Scott Tokessy Memorial Tournament continues to grow each year as the tournament becomes more widely known both locally and further from home. Local teams from Districts 2 and 6 compete alongside teams from Southern, Central and Eastern Ontario (including the Ottawa Valley), Western Quebec and northern New York State. Many coaches return with their teams to the tournament each year. We also have other activities during the weekend such as raffle draws, food concessions and souvenir concessions. This year’s tournament will involve a total of 48+ teams with an “A” and “B” divisional format. Looking forward to seeing you at this year’s tournament. Click here to find out how to volunteer, and how to become a tournament sponsor. Follow us on social media for updates on what is happening with the tournament!